There is a waymarked trail to the summit which loops over the ridge leading west from this hill. See track 3881. 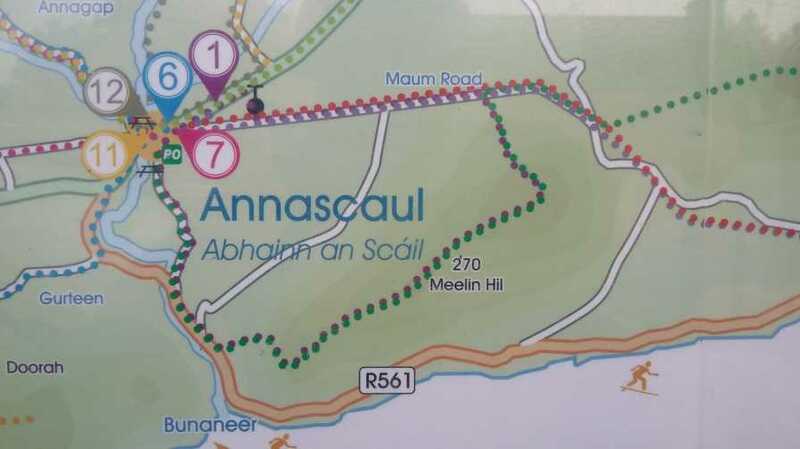 The quickest route to the top would see you park in Annascaul village and walk up the Maum butter road eastwards (incidentally this is also part of the Dingle Way), before crossing a stile southwards at Q61478 02068 B. Having reached the top, you can follow the trail westwards along the ridgetop, whereupon two further rises occur Brackloon (270m) and Meelin Hill (212m). Follow the walker posts down to the road at Q59652 00497 C.